The foundation of Relaxed Relationships is to choose the highest level of consciousness while in the midst of relationship challenges. This includes all relationships; whether that be with your mate, your friend, your family, your business partner, your alarm clock, traffic, etc. However, we have discovered through our local workshops, those intimate relationships are the most difficult arena for applying the higher levels of consciousness. Making them the most powerful for spiritual growth. So, are Relationships a Necessity for Personal Growth? We have found the importance of relationship is not often valued, especially when it comes to personal growth and fulfillment. Not only do spiritual texts spell out the necessity to experience love through relationships but there is also new evidence that proves to choose the single lifestyle is hazardous to our health. When I first read A Course In Miracles, by two psychologists determined to see life another way. I read a very deep book explaining the nature of reality, the importance of always being my higher Self, and how to attain this spiritual transformation. The good news was that I could do it alone, or so I thought. Before I began to read the text I had to meditate. I had to reach a certain level of inner stillness to make it through a single paragraph. The teaching is so deep and profound. It speaks of illusions versus realities, and our fundamental error that we believe we are separate from one another. I fell in love with the book and its wisdom. I found it spot on about who I am (when I wasn’t in a romantic relationship that is). A friend suggested I read A Course of Love, by Mari Peron, which is the series following A Course In Miracles. Many are unaware of this sequel even today. A Course of Love talks about our relationship with the Divine, as well as, our relationships with one another. The series makes statements such as, “Reality doesn’t exist without relationship”. For those who want to question this point of view with, Yeah but, we are all one and therefore relationships matter very little. Yes, you are absolutely right. It’s important to know, you are referring to the plane of peace. Peace is the second highest level of consciousness below enlightenment and is found in a level four relationship on the Relaxed Relationship compass. So, it is true if you have integrated the level of peace consciousness or higher, as such individuals like Mother Theresa, Gandhi, Budha, Krishna and Jesus, your relationship to everything will dissolve. I have since completed a fourth round of A Course in Miracles, and have discovered a very enlightening message. 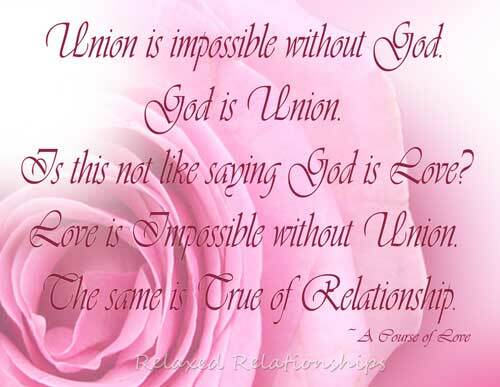 A statement that clearly says, ”Get in a committed relationship, stay there, and do the work!” Of course, the message was in A Course in Miracles all along, as it mentions “Joy is a by-product of relationships” and the “Ark of peace is entered two by two”. Obviously, the text didn’t change, but I am just now able to read it from a different point of view. 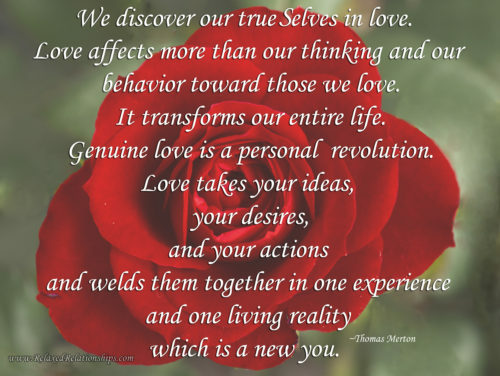 Reading and applying the text from within the devotion of a relationship changes everything . . . Changes Life! Are You Choosing Safety at Love’s Expense? “This wanting to do things on your own is a trick of the ego, your pride a gift the ego demands”. It’s important to know, both joy and peace are the highest planes of consciousness according to the scientific research of Dr. David Hawkins. 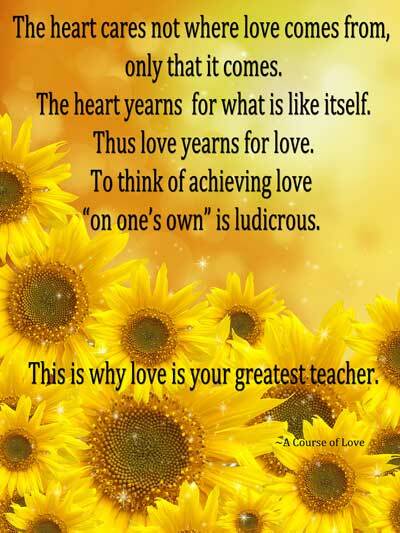 Furthermore, only .4% of the population will ever reach the plane of true love which falls just below joy and peace. So, I think it’s safe to say that to transcend up the ladder of consciousness, intimate relationships are indeed a necessity for personal growth. 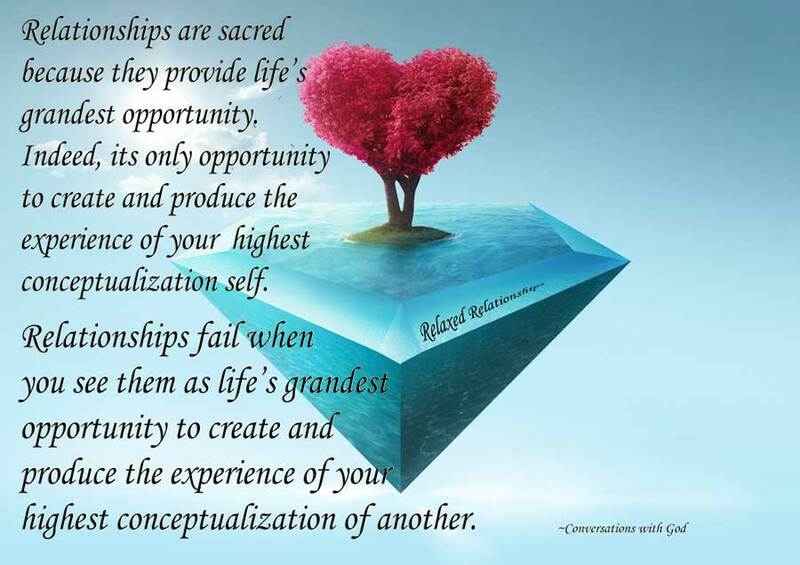 To learn more about how to make your relationships your spiritual practice? 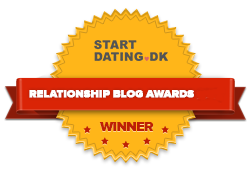 Check out our Relaxed Relationship Workshops. This information is test-driven for Accuracy and Injected with Experience. Thankyou Argueta. Blessings to you!